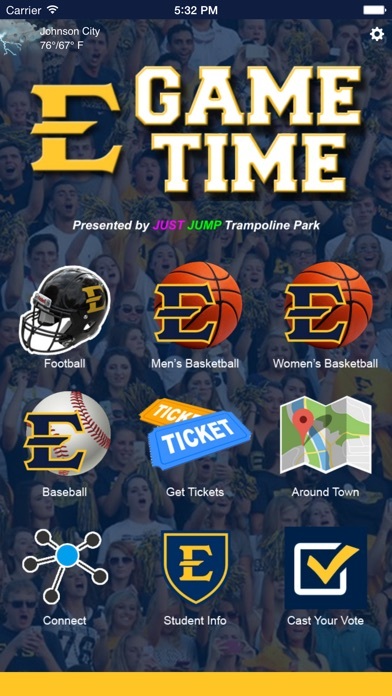 The official app for ETSU Athletics, ETSU Game Time, provides Buccaneer fans with all the essential information they need when heading to Kermit Tipton Stadium, Freedom Hall or Brooks Gym to watch ETSU football, men’s basketball and women’s basketball. ETSU Game Time is designed to enhance your game day experience. Whether you are a lifelong ETSU fan, student or a visiting team wanting to learn more about the game day experience in Johnson City, ETSU Game Time provides answers to questions regarding tickets, tailgating, parking, bus routes, regional entertainment and more. 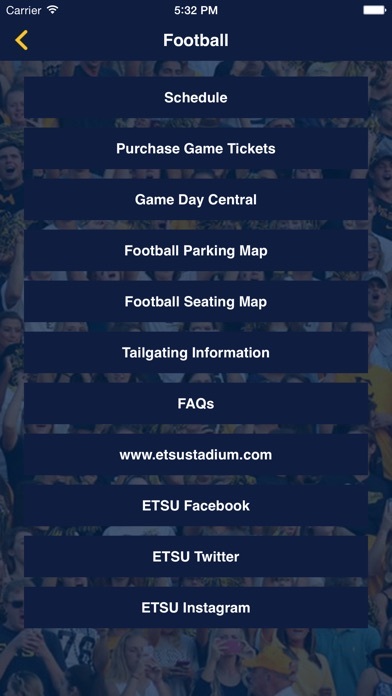 •Football – This component of ETSU Game Time is the perfect place for everything you need to know regarding the ETSU Football game day experience. 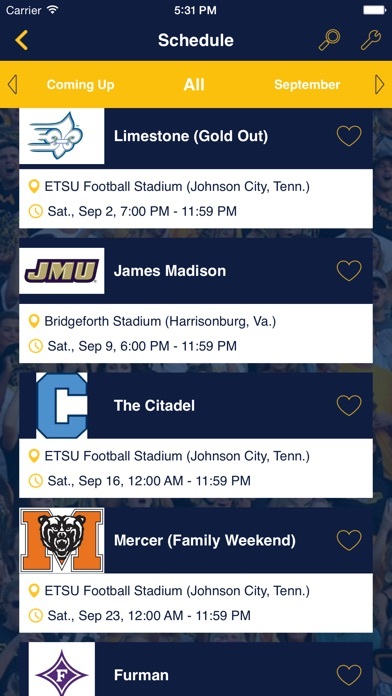 The Football button provides users with scheduling information, links to purchase tickets, traffic and parking maps, stadium seating diagrams, tailgating policies and opportunities to connect with ETSU Football on social media. •Men’s Basketball – Support ETSU Basketball during the season and find everything you need to know regarding the game day experience at Freedom Hall. The men's basketball section of ETSU Game Time contains scheduling information, ticket purchasing opportunities, social media pages and more! •Women’s Basketball – Stay up to date with ETSU women’s basketball and the exciting game day experience inside Brooks Gym. Familiarize yourself with the Brooks Gym seating map, purchase tickets and follow the Bucs on social media. •Baseball – Stay up to date with ETSU baseball and the exciting game day experience inside Thomas Stadium. Familiarize yourself with the Thomas Stadium seating map, purchase tickets and follow the Bucs on social media. •ETSU Athletics – Find everything you need to know about ETSU Athletics! •Around Town – Looking for something to do? Find the best places to eat, stay and entertain your friends in Johnson City. •Social Media – Do you want to be the first to learn breaking news, score updates and what's trending? 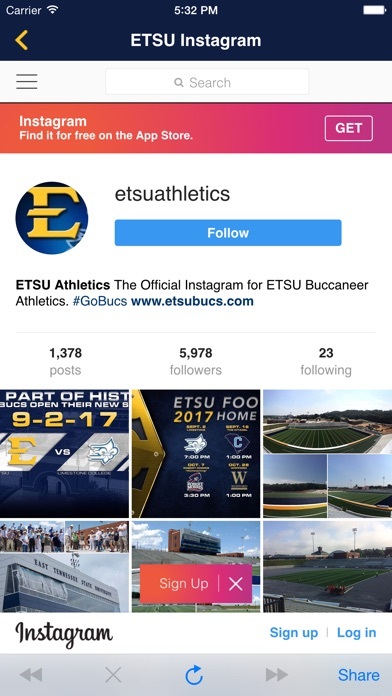 Follow the Bucs on all of the official athletic department social media outlets. •Student Info – ETSU students, this page is dedicated to you! Learn all you need to know about the game day experience, student ticket and parking information, shuttle schedules and how you can establish traditions at ETSU athletic events. •Cast Your Vote – Your opinion matters! Get involved in real time by participating in ETSU promotions, contests, surveys and more. This year, plan your ETSU Buccaneer athletic experience before you leave your house. 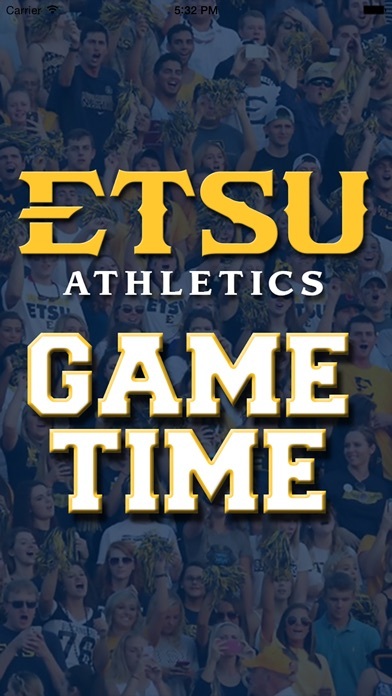 Be ready to cheer “Go Bucs” and don’t forget your Blue and Gold – download ETSU Game Time today!